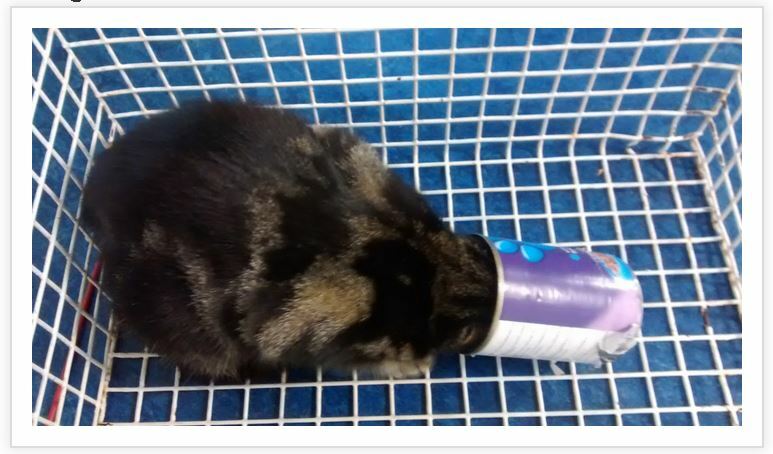 A feral cat foraging for food got herself into a dangerous position when her head got firmly stuck inside a can. Thankfully, she got help. A feral cat foraging for food got herself into a very dangerous position when she reached her head way down into a can of cat food and got it stuck there. Had she not been rescued and gotten help with the can, the consequences might have been dire. The RSPCA UK came to the rescue after being called in to help. Since kitty was feral, she was not kept at the shelter and offered for adoption. Instead, she was given her spay surgery and then released back to her home turf. The cat was found near to a property in Handsworth, Birmingham last month. She had managed to get her head well and truly stuck and was quite distressed by her ordeal. A concerned member of the public called the RSPCA and inspector Scott Vanes attended and took the cat to the RSPCA Birmingham Animal Hospital at Frankley. Vets managed to remove the can and luckily the cat was not injured. Inspector Vanes said: “As this was a feral cat, she was clearly not rehomable, but thankfully the member of the public who contacted us was happy to continue feeding her and we therefore were able to release her back to the location where she was found. “Before she was released we also spayed her, as part of a preventative measure as there are currently hundreds of unwanted feral cats up and down the country and we didn’t want her to fall pregnant. “This does highlight the dangers that litter can pose to wildlife and also domestic animals, and incidents like this can easily be prevented if people just picked up their rubbish rather than throwing it away and remember to squeeze cans together before throwing them away.